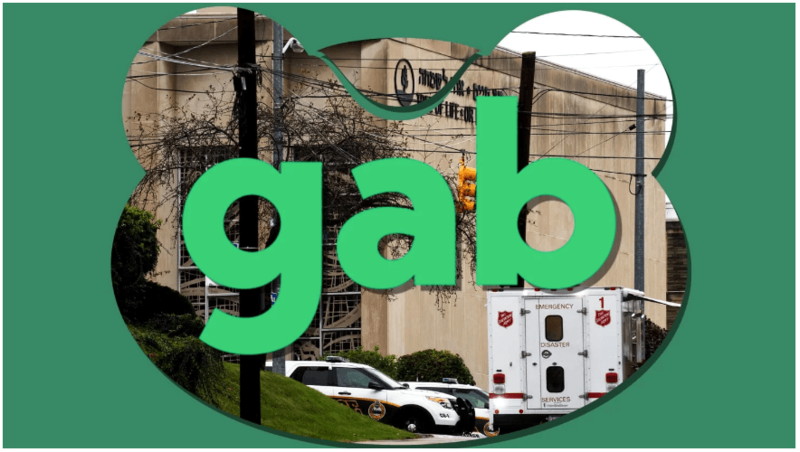 It was the very first consequential effect of the Pittsburgh Synagogue false flag operation: Gab.com was essentially shut down. The following excerpt from Wikipedia provides some of the reasons why Gab fell so hard and so fast. Gab is an English-language social network service. It allows its users to read and write multimedia messages of up to 300 characters, called “gabs”. The website was created by Andrew Torba in 2016 to counter what he perceived as “left-leaning Big Social monopoly” in other social media platforms. The site purports itself as an “alternative of Twitter” and “champions free speech”. Gab has attracted migration of known banned users from other social networks, most of whom were members of the far right. Gab reached 465,000 users in April 2018, a majority of which are white, conservative males. Many of Gab’s most followed users are prominent far-right individuals, including Richard B. Spencer, Mike Cernovich, and Alex Jones. The takedown of Gab.com was immediate, illegal and obviously planned well in advance. 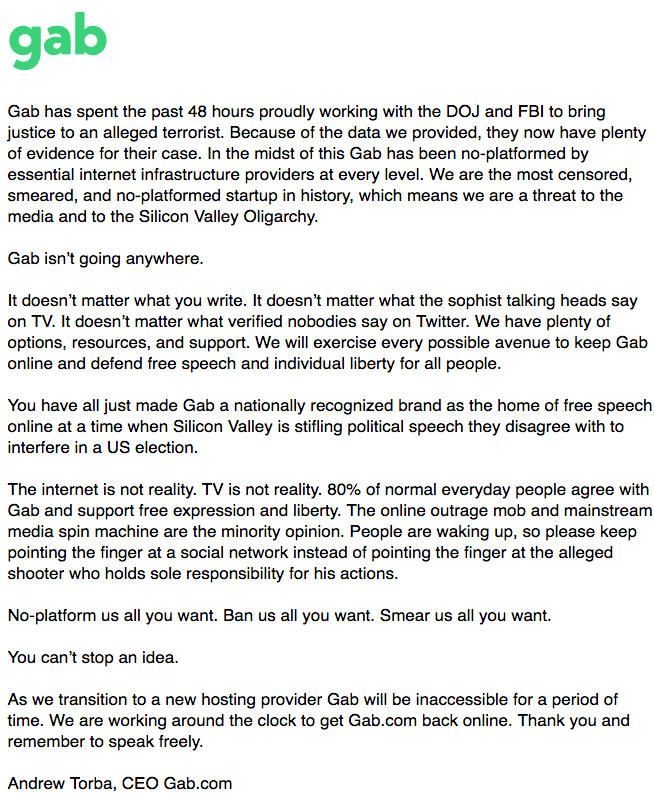 For anyone who doubts the seriousness of this outright assault on free speech, the following official statement by Gab is posted below. What is abundantly clear from this extraordinary response is that the Second Amendment is now in extreme jeopardy. Clearly the actions taken by all the other social networks and related co-conspirators are unlawful. However, in this way the global Internet community is being cynically conditioned to accept that these illicit takedowns are perfectly okay. They’re not okay! They’re basically criminal conspiracies executed to eradicate the competition to Deep State entities … … … and especially to completely control the dominant narratives disseminated across the World Wide Web for the foreseeable future. The CIA’s Mockingbird Media will not be challenged or threatened by anyone or any entity under the sun. The Mainstream Media Magnates have always controlled the flow of information throughout every sphere of life in American society and beyond. TPTB will simply not tolerate any significant encroachment on their market share. Not no way, not no how! And the meticulously pre-planned collapse of Gab.com irrefutably proves this point. We have not even seen the tip of the iceberg of this synagogue psyop. This Deep State black operation runs so deep that the American people will be subjected to the highly radioactive fallout for years to come. The following exposé delineates just a few of the hidden objectives of this Gladio-style MCE. There have been LOTs of false flag shootings over the years, but never one that targeted a synagogue on Saturday morning during services. This is the BIG one — the real BIG one — that many of US have anticipated and been very concerned about. If there is a single mass shooting that has the capacity to profoundly change the national conversation around gun control, this is it. It’s also why so many Alt Media websites were either shut down or blackballed by the social network utilities over the past few months. It’s also why the Deep State will not permit any new, particularly Right-leaning social media from gaining a firm foothold in the cyber-marketplace. This is truly a very serious situation; for the Second Amendment is being insidiously abolished as we write this. Hence, one of the best ways to meaningfully reverse this trend toward targeted social oppression is to vote on November 6th. You know who to vote for, so VOTE like your freedoms depended on it because they do. Because this rapidly unfolding New World Order agenda represents a fundamentally globalist initiative to curtail the free speech of all Patriots and Nationalists, Christians and Conservatives, Tea Partiers and Libertarians, Republicans and Independents, etc., the movement needs to substantially unify in order to stop it. This movement has already been forming over many years, but it needs to strengthen considerably. The Patriot Movement also needs to stay purposefully disorganized, highly amorphous, and quite ill-defined in the eyes of the unaware public. In this way, our extremely effective asymmetric cyber-warfare will continue to have great effect as we leverage to the max what power and presence we still have in cyber-space.